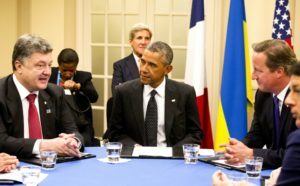 WASHINGTON — The Ukrainian government held an emergency meeting between their president Petro Poroshenko and his security chiefs after the rebel-held eastern provinces voted to align with Russia. Reuters reported that the elections were disapproved of by Europe, U.S. and the Ukrainian government. Russia disapproved of the latest Ukrainian elections, which shored up Poroshenko’s support in the national legislature and where pro-West platforms won the day. Kiev said this could create a “frozen conflict” with Russia, even after pro-Russia rebels continue to violate terms of their ceasefire and attack and kill Ukrainian soldiers in the eastern regions.